Cisco Solutions deliver a broad range of technology solutions that work together to support the business of today, and business for the future. Whether your customers' goals are to work from anywhere, connect remote offices, or simply improve performance, we will collaborate with you to understand their needs in order to design, install, and maintain a solution that meets unique requirements. Contact our Cisco Security Product Manager for more info! 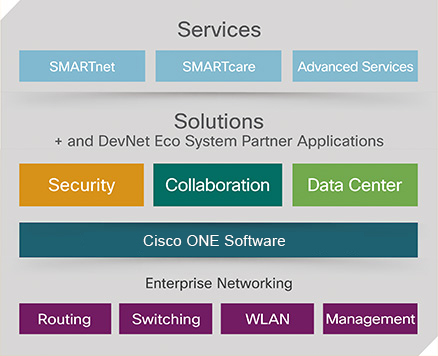 Cisco ONE Software is a valuable and flexible way to buy software for your Data Center, WAN, and Access domains in pre-packaged software suite “bundles”. The network infrastructure must evolve. Users need a new architecture to automatically provision and rapidly deploy network services and applications.